Much to the surprise of one of our volunteers, there was a cage with two parrots left at the front door of the shelter this morning. The note with them told us their names and ages and asked us to take good care of them. The cage they were in was much too small, so today's unexpected purchases included a large cage, parrot food and toys. 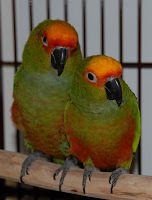 A little research determined that Fran and Paco are gold-capped conures, a type of small parrot, and probably cost their owner $350 - $400 each. Things are never dull at the shelter. Know anyone looking to adopt some gorgeous birds?